AHA Basic Life Support (BLS) for Healthcare Providers (classroom) courses are the best for medical professionals and students. It provides all healthcare providers and students the ability to recognize several life-threatening emergencies, provide CPR, use an AED, multi-rescuer resuscitations, and relieve choking. Our BLS courses by AHA are intended for medical care providers: EMT’s, paramedics, nurses, doctors, dental assistants, and also medical/dental/nursing students. This AHA BLS course is the most common CPR certification course, as a result AHA BLS has become the “gold standard” in CPR courses for medical clinicians. AHA BLS is by far are the most widely accepted courses by nursing schools, hospitals, dentist offices, medical clinics, and treatment providers. We’re not saying non-medical people can’t successfully take and complete this course. Many non-clinicians have taken BLS and done well. It’s more complete than the AHA Heartsaver course, and includes 2-rescuer CPR. Also, BLS tests use of a BVM, and team rescue CPR, which are not taught in our Heartsaver CPR courses. Finally, our course schedule. The 2016 version of AHA BLS course combines the 2011 version of BLS for Inhospital Providers course with the 2014 version of Prehospital Providers, in one course. The same AHA BLS Provider certification (good for 2-years) card, and we offer “end-of-class” cert. card! AHA Heartsaver courses teaches CPR, use of AED, and relief of choking (all ages) in every course. There are options for Adult CPR and AED, First Aid only, Adult First Aid/CPR/AED, or Child/ Infant CPR/AED, or Adult/Child/Infant CPR & AED. This grouping of courses is designed for lay responders, or non-medical professionals. Every AHA Heartsaver course provides certification for 2 years. An exception is BloodBorne Pathogen course – which is only a 1-year certification per OSHA rules. The target group would include fitness center staff, day care providers, teachers, personal trainers, and coaches. Similarly, also includes employees in most workplaces, caregivers, church staff, etc. So, here’s our Heartsaver course schedule. Nursing or medical students, EMT students, dental clinic staff, etc. – probably should take the AHA BLS for Healthcare Provider course and not the Heartsaver course. Also, take only an AHA BLS course! Because in GA, most other BLS courses, including Red Cross BLS, are not accepted). So, we only teach AHA BLS courses. Information on AHA online courses. 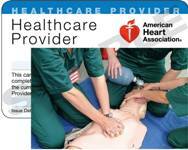 Both the AHA BLS for Healthcare Providers course and each AHA Heartsaver course can be taken on your home computer, usually for $25 to $35. To receive certification, you must follow (within 60 days) with a hands-on skills session. That includes practice and skills check with manikins and an AHA instructor. This is official AHA training, with official AHA BLS Provider or AHA Heartsaver cert. card. It is a little faster than a classroom class. It takes 1 1/2 to 2 hours for the AHA HeartCode BLS online course. Similarly, it will take about 40 min. or so for skills practice and skills test. You register and access the AHA online courses at onlineAHA.org. We can do AHA BLS skills session for $45 anywhere (your place), almost anytime, or for $30 prior to one of our scheduled classes. Likewise, we can do AHA Heartsaver skills session for $60 anywhere (your place), almost anytime, or for $50 prior to one of our scheduled classes. Any questions about any of the AHA (Amer. Heart Association) courses we teach, please Contact Us . Q. What about AHA books in your classes? Do I need a book, do I have to buy a book? Generally, all 4 major emergency response training organizations require students have a book available during their in-person training courses. Those 4 are Amer. Heart Assn., Amer. Red Cross, Amer. Safety & Health Inst., and National Safety Council. We will have a loaner book for you in class, or a new book for purchase, if you choose to purchase one. Generally, the BLS Provider course and First Aid course has content to refer to in class, and the CPR_AED courses do not. If you complete an online class, from any of them, the online content is available to you, so you do not need any book. We’ve found that most students prefer to save $15-19, and not carry home a book. For this reason, we’ve decided to make available the AHA course books (loaned) during your class. It’s optional to purchase for $17.00 (except $19 for 1st Aid/CPR). You can also purchase AHA books (before a class or afterwards) from either of the 3 AHA-approved distributors (for $13.25-$15.95 plus shipping), namely Channing-Bete, Laerdal, or Worldpoint). 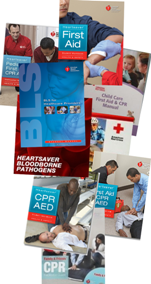 AHA also has “eBooks” available for all of their courses ($13.25 for BLS for Healthcare CPR, $2.50 for Heartsaver, $36.95 for ACLS), obtain your ebook from https://ebooks.heart.org/ . Schedule of AHA courses by Newnan CPR. All of our healthcare-level courses are official American Heart Assn. courses, with same-day certification! For our OSHA workplace, or family, or lay responder customers, we teach both AHA Heartsaver and ASHI CPR & First Aid courses. 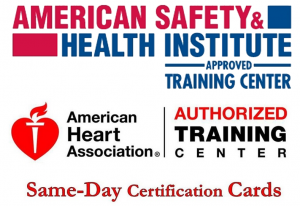 As an official AHA Training Site, and ASHI Training Center, we offer same-day certification cards on both. For a private business, on request, we can also also teach/certify courses for ASHI,, for AHA, for American Red Cross , or National Safety Council courses. That includes BloodBorne Pathogens for General Industry, and BloodBorne Pathogens for Tattoo Artists. We can also do the hands-on (with manikins) CPR skill checks (also called Blended Training) for AHA, ASHI, ARC, or NSC. All CPR/AED and First Aid courses are two-year certification course, except Bloodborne Pathogen, which is one-year certification course. (That’s an OSHA rule, not ours). Schedule of ASHI courses by Newnan CPR. AHA Disclosure: “Use of AHA materials in an educational course does not represent course sponsorship by the American Heart Association. Any fees charged for such a course, do not represent income to the Association. (Except for a portion of fees needed for AHA course materials)” .